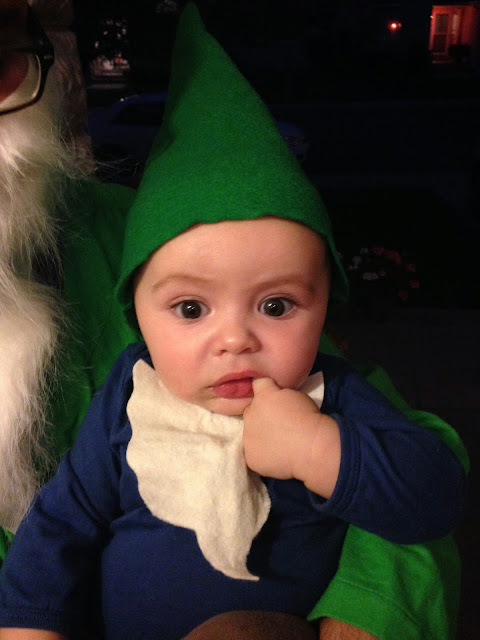 As I write this, you are 6 ½ months old. Your adoption was just finalized in court and yesterday we were sealed together as a family in the Mt. Timpanogos LDS temple. Today you are getting blessed in church. This has been an amazing and emotional week, we feel so blessed to be your parents. I want to tell you the story of how you came into this world and how you became ours. It’s a very special story – and it has to be, because you are a very special and important boy. You are literally a miracle. We wanted you in our lives for so long – years before you were even born. We tried very hard to have a baby, but nothing worked. Eventually, I was diagnosed with a disease called endometriosis. It’s very painful and made it so that I cannot have children. We were so sad, we felt like we were never going to be able to have you. Eventually, we realized that God had a different plan and that you were supposed to come to us in a different way. There were lots of experiences where we knew that we were supposed to have children; we could feel your strong and sweet spirit almost all the time. I knew that I was supposed to be a mother to a little boy (and other children that have yet to come into our lives). I knew that you were mine, but that I wouldn’t give birth to you. It was such an odd thought. How could I have a child that was truly mine even though I was never pregnant with him? That’s when we decided that adoption was the route that we wanted to take. 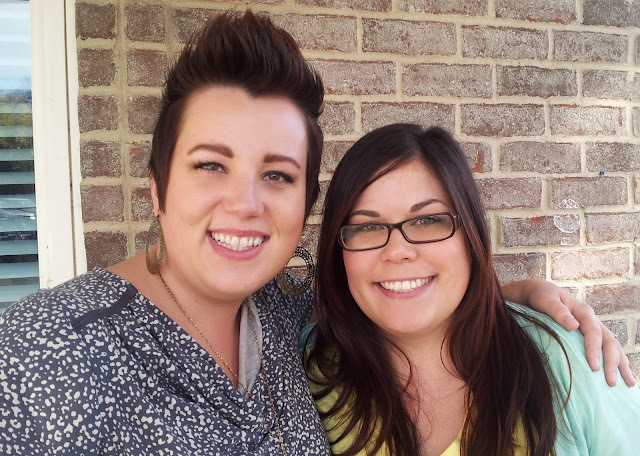 Before deciding on adoption, everything felt confusing, nothing was working, we were miserable… it was literally hell. When the decision was made, it felt like the heavens opened up, angels were singing, the sun was bright and shining, and everything was right in the world again. This was the right decision. This was how we were going to find you. We started the adoption process excited, happy, and nervous (like almost every other hopeful adoptive couple). We went to all the training classes, went through background checks, home visits, had personal recommendations sent in from friends and family… it was a pretty intense and stressful process (but it was worth it!). After waiting months and months, we were contacted by two other expectant mothers before we met your birth mom. One of the people that contacted us ended up being a scammer (who does that?!) and the other was a girl who was pregnant with a baby girl due in May 2013. This girl ended up changing her mind and decided that she was going to parent her child instead of placing her for adoption. At the time, it was devastating, but it ended up being such a blessing for us and her. We have so much love for this woman and know that she made the right decision for her and her daughter. Exactly a month later, our caseworker called to say that an expectant mother, who was working with their agency, wanted to meet us. We were ecstatic! She sent me an email telling us more about herself and we exchanged phone numbers and we ended up texting non-stop and had a couple phone calls over the next few days until it was the day that we were supposed to meet. That day, I was a nervous wreck. I was so worried that she wasn’t going to like us, or that we wouldn’t really connect with her. I said lots of prayers so that I could feel peace about whatever decision she was going to make. After Chris, your Daddy, got off work, we drove up to Salt Lake City to meet this girl and her mom. When we walked into the room at the agency where they were waiting, there was an overwhelming feeling of warmth and love. They smiled and gave us both hugs. When meeting an expectant parent for the first time, it’s customary to bring a gift, so I had made her a scarf and then my friend had made her some cute handmade hair clips. She loved everything. We spent the next hour asking each other lots of questions and talking about our plans for the future, our goals as a family, why we wanted children, how we felt about openness with adoption… We discovered that we had a lot in common with her and her family - it was really cool. Some of the biggest ones were, she and I are both named “Julianne” (same spelling), her Dad and your Grandpa have the same first name, she used to live in Virginia and that’s where your Daddy had served his mission, she and Daddy had gone to the same high school (8 years apart), she and your Grandpa have the same birthday… we even all looked alike! Like if you were to see your Daddy and Julianne next to each other, you would think they were brother and sister. It really felt like it was meant to be. Later, she gave us a gift with a balloon saying that you were a boy (we didn’t know before that), a little onesie that said “I ♥ Daddy”, and some bath salts for me. It was so sweet! 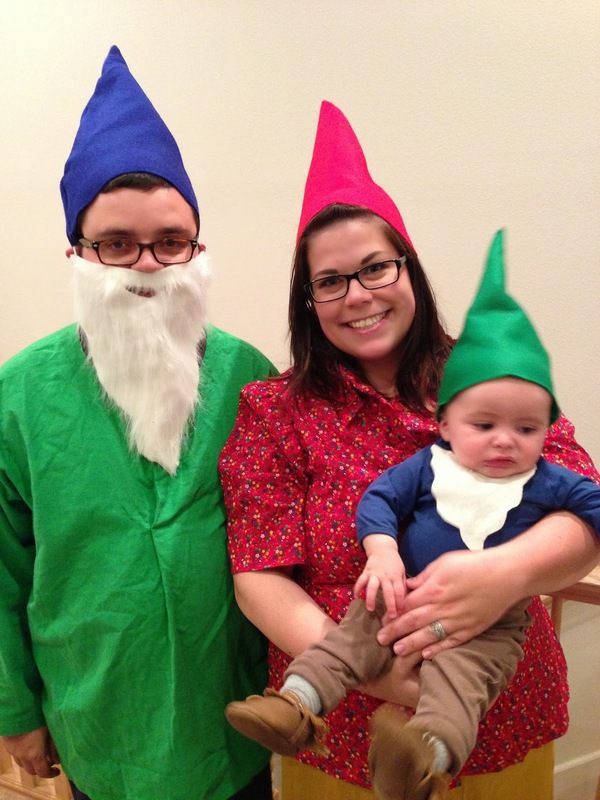 She said that one of the reasons why she picked us was because of this picture that we had posted on our profile of us dressed up as lawn gnomes for Halloween. She felt like Seahorse (that’s what she and her family called him) was going to be a really interesting and special kid and that he needed parents that would understand him and let him be himself. She also loved that we were both artistic and seemed really open-minded and not judgmental of people who were different than us. We got along so well, she couldn’t imagine anyone else being his parents. We spent the next month and a half getting to know each other better: we got pedicures together, we went to dinner with her family, she came to two of my baby showers… we soaked up every minute that we had together because we knew that it was going to be different once she had the baby. She even wanted us to come to all her doctor appointments and ultrasound appointments – which she had lots of because her pregnancy was considered high-risk. She had low amniotic fluid at one point from working too many double shifts at her job, so she was put on bed rest for the last couple of months during the pregnancy. You were literally a miracle because Julianne actually didn’t know she was pregnant until she was about 6 months along. She said that she was definitely not ready to be a mother – she didn’t even know if she ever wanted to have kids and that if she had known that she was pregnant earlier, she would have considered an abortion. You were meant to be here, you were determined to be born. God knew that you were supposed to be ours and that we needed this connection to Julianne and her family, so he helped you “hide” for 6 months. Sounds crazy, right? But we all felt so strongly that this was part of His plan. On the day that you were born, I drove up to Julianne’s doctor appointment thinking that you were a week away from being induced. Everything was normal at the appointment, but she was feeling really tired. Instead of hanging out afterwards, she just wanted to go home and sleep, so I dropped her off and then drove home. About 4 hours later, she called and said that she was in labor! I called Chris, he immediately came home from work and we drove back up to Salt Lake City. We arrived at the hospital and they were already giving her the epidural when we came to her room. It took a while to kick in, but once it did, she was feeling much more relaxed and ready to have you. She wanted us, her Mom and sister, and her caseworker in the delivery room with her– which was amazing, we were so excited to participate in your birth. Her sister and I held her legs while she was pushing and after 6 hours of labor and only 20 minutes of pushing, you were born at 11:02pm. 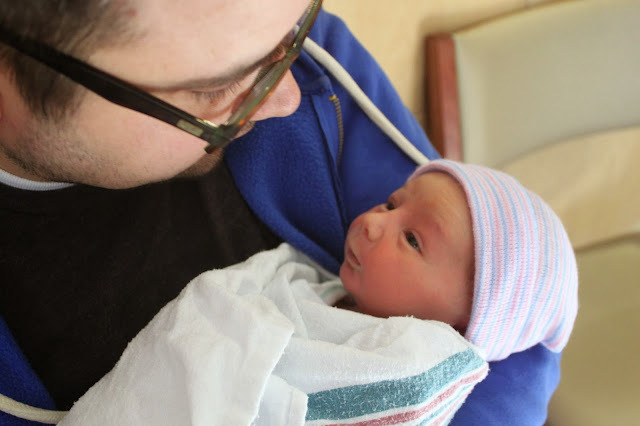 Daddy cut the cord and then the nurse whisked you away to do some testing and to weigh you. Once all that was taken care of, we were finally able to hold you. Julianne wanted me to be the first one to hold you – she didn’t feel like she was your mother, she was more the vessel to get you into this world and that your parents needed to be the first people to spend time with you. I know that’s not a common thing in adoption, so we were very blessed to have that experience first. Holding you for the first time was so surreal - this child that we had waited for so long was finally here. You were perfect. We counted all your fingers and toes, kissed you over and over, and hugged you tight. We hugged Julianne and her family and we all cried out of joy together. We had just been through this amazing experience together and had brought this beautiful little human being into the world. Over the last 8 months (two months before you were born and 6 months since), we have developed an amazing friendship with Julianne and her family - it was like they were always supposed to be part of our family. They are all truly amazing and really good people. We wanted an open adoption because we felt like there couldn’t be too many people loving a child. We had seen the blessings of open adoption through friends who had adopted and through my cousin’s adoption (she placed her son for adoption when she was in high school). Sure there are lots of fears about open adoption – maybe the birth family will want the baby back (in Utah, they can’t take him back after the birth mom relinquishes her rights), maybe they will come around all the time and judge our parenting (that hasn’t happened), maybe having a relationship with them will cause confusion for the child – who is his mother, does he have two? These are all valid concerns, but they didn’t worry us at all. These were just things that people asked us when we explained what kind of an adoption we were going to have. Julianne and her family had always said that you did not feel like theirs. They knew that you belonged in another family and that she was not meant to be your mother. There has always been a huge level of respect between us because we were both giving each other something we couldn’t do or have on our own. They are a huge positive part of our lives and we are so blessed to have them. You will always know where you came from and always have access to them if you have questions or want to have a relationship with them. This is always what we wanted. We love this. We each have a unique path in life, and I feel incredibly blessed that mine has crossed with this wonderful couple. Chris & Julianne are two of my favorite people. As a birth mom myself, I have a special connection to them and where they are headed in this adoption journey. It is so refreshing to hear from two people who are genuinely interested in making an adoption connection forged in honesty and true acceptance. They are both looking forward to building a relationship that the family their child comes from can be comfortable with. They are excited to celebrate the unique personality and character of the child they will raise, and will always share with them the love that has been experienced by all to create their family. My most favorite aspect of Chris is that he is simply hilarious. He has the ability to bring out laughter in everyone even during times that would seem challenging. He is kind and thoughtful, and has a genuine interest in other people. He is a talented artist and musician, and enjoys sharing those gifts with others. I strongly believe that he will be a fantastic father, and has so many things to offer his children. The greatest things he will offer are stability and a strong love and respect for his wife, all of which are incredibly important. There are not enough words to express the gratitude I have for my friendship with Julianne. She is the most genuinely caring, non-judgmental person I have ever come in contact with. There is a warmth about her that brings out the best in everyone. She has inspired me in countless ways, and has been so encouraging of where I am headed in my life. Her natural abilities in all things crafty and artistic astound me. Her eye for beautiful and unique things is simply amazing. She is so thoughtful and loves to share her creative talents with those she cares about. She is giving, not only of her talents, but also of her time and wisdom. There are a great deal of moments I treasure between us, simply because she was there to offer her support and guidance. I have had the pleasure of experiencing her interact with my daughter, as well as several children in her family. While I realize it has been a long and painful journey for her towards parenthood, I strongly believe she was blessed with that wait so she could develop a great ability as a caregiver. She has so much love, kindness, and patience to offer a child. Julianne will be an amazing mother, and I look forward to seeing her blossom in that role. There is a strong stability and love within their extended families. I have met both Chris and Julianne's parents, as well as several of both of their siblings. Everyone in the family has been very warm and accepting. I know that as they have witnessed what Chris and Julianne have experienced in their infertility struggles, the family as a whole has been strengthened. An open and honest relationship exists within the entire family. Everyone has been supportive and they are all excited as Chris and Julianne pursue adoption to build their family. Upon my first meeting of each of them, I knew something wonderful was bound to develop between us. As our friendship grows, I have learned to love them even more. I am inspired each day by the strength in their relationship. After so many obstacles have been placed in their way, they remain firm in their love for each other. All of the challenges they have faced have only strengthened their connection. Chris has been incredibly supportive of Julianne as she has faced a great deal of physical and emotional pain, and in return she has been there for Chris during times of confusion and frustration. Through all of the mix of emotions they have sifted through together, a powerful love exists. This post is difficult to write and I think it's taken me about a week to hit the "publish" button. It's not a secret, anyone who comes into contact with us or follows either of us on facebook, knows that we haven't been able to have a child on our own and are hoping to adopt. Well, this is my infertility story. Warning: this story may contain information that may be tmi for some people and also contains a couple pictures from a surgery that I had. 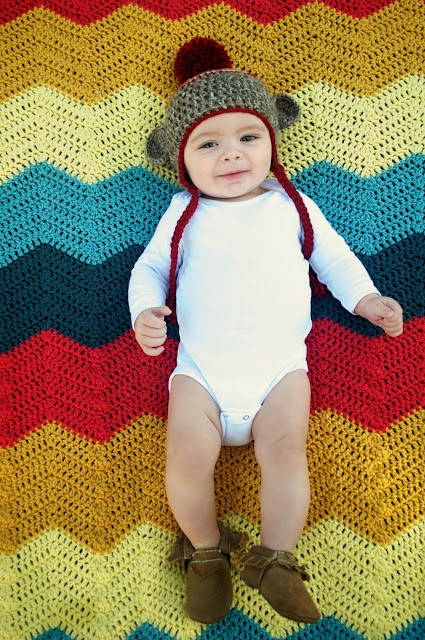 Chris and I had been trying to have a baby for a little over a year before I started seeing my doctor for infertility. There are so many factors that go into getting pregnant and timing is everything. It's more complicated than I had expected because you have to use ovulation predictor kits, take your temperature, track your periods... the list goes on. I guess I had always expected it to be easy. I had friends that got pregnant all the time, some it felt like as soon as they thought of getting pregnant, they were pregnant. Why wasn't it working that way for me? Why did I have to go through all this stuff to even know if I was ovulating? I always had a period every month, but my cycle lengths would always range between 21 and 35 days long. So my cycles were regular, but not. A couple of doctors told me that we just needed to keep trying and it should work out. In December of 2010, I started having a lot of abdominal pain on my left side (by my ovary). It felt like something inside me was twisting and wanted to burst. I had no idea what it was, so in January, I went to the doctor. He said that it was probably an ovarian cyst so they did an ultrasound and found one on my left ovary and that the pain would eventually go away once the cyst was gone. That particular cyst went away, but my pain didn't. About three months later, I went back to the doctor and after another ultrasound, they found that I had another cyst and they sent me home to wait it out. Around the same time, I found out that both of my grandmothers had hysterectomies (where they surgically remove your ovaries and uterus, or only just your uterus, leaving your ovaries). My Mom's mother had everything removed after an abnormal pap-smear. When I asked her if that meant cancer or something else, she didn't remember (she was in her late 80's and had been through several strokes so her memory was not that great). My Dad's mother had everything removed after almost dying from a burst endometrioma that filled her abdomen with toxic fluid, etc. She passed away before I was born so I wasn't able to talk to her directly about it. My Dad's sister also had a hysterectomy because she had been suffering from endometriosis and didn't want to have to deal with the pain anymore. I gave this information to my doctor and he decided to do further testing. He decided that I may have endometriosis because of my strong family history of it. 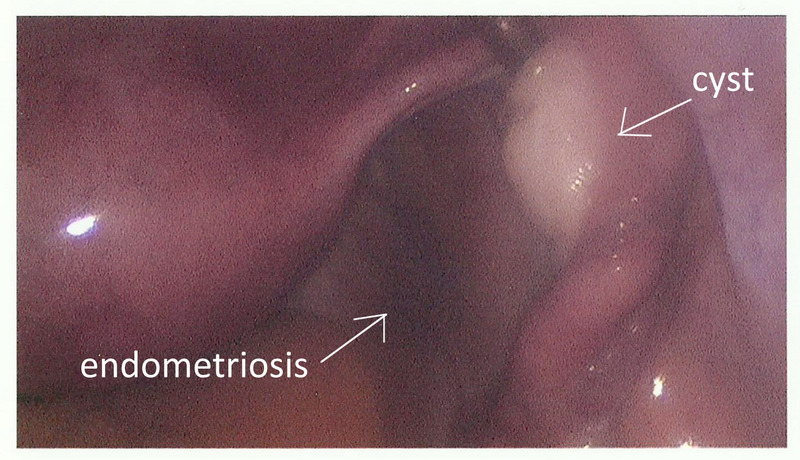 Endometriosis happens when the tissue that lines the uterus (the "blood" that comes out when you have your period) starts growing outside of the uterus on other organs in the body. These growths are not usually cancerous. The growths "bleed" when you have your period and because it has no way of leaving the body, it can cause inflammation, scar tissue and pain. As the endometrial tissue grows, it can cover or grow into the ovaries and block the fallopian tubes. Trapped blood in the ovaries can form cysts and if these cysts continue to grow and eventually burst, they will fill your body with toxic fluid and you will get very sick (this is why my Grandma had her hysterectomy). Endometriosis also can cause inflammation and cause the body to form scar tissue and adhesions, tissue that sometimes binds organs together. This scar tissue may cause pelvic pain and make it really hard to get pregnant. 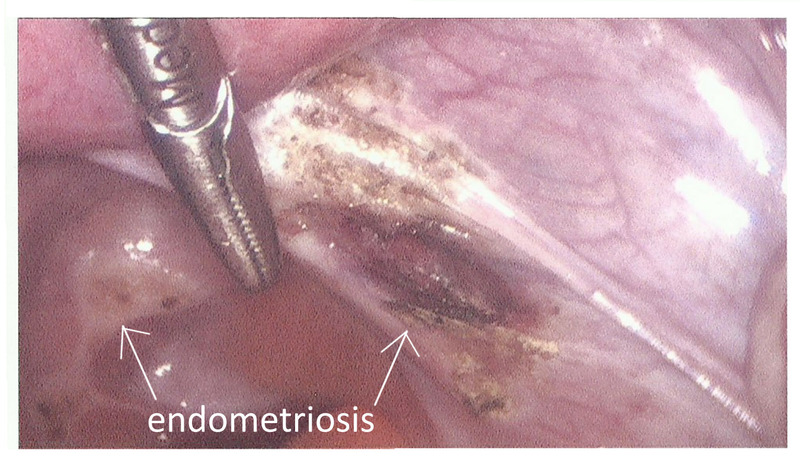 In September of 2011, I had laproscopic surgery to see if I had endometriosis. My doctor found quite a bit of it on and around my left ovary, on my uterus and behind my uterus and they also found a cyst on one of my fallopian tubes. None of the endometrial growths or the cyst were cancerous, it was just regular old endometriosis. He was able to remove all of the growths and said that I should be able to get pregnant sometime in the next six months. 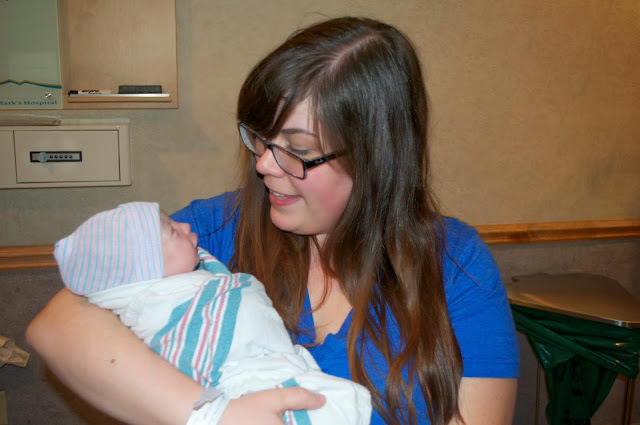 A couple of weeks later, I started taking clomid to help me get pregnant. Clomid basically forces you to ovulate, often releasing more than one egg, so your chances of getting pregnant (especially with twins) goes up significantly. I hated the clomid. It made my ovaries ache all the time, I had hot flashes, was super moody... it just wasn't good. I felt like I was going through menopause. It totally sucked, but I kept taking it for the whole six months because I wanted to do everything I could to have a baby. After taking the clomid for the full six months, it had been over two years of trying to get pregnant and we started getting really depressed about it. Nothing was working. Why couldn't I get pregnant? We started considering IVF (invitro fertilization) and other infertility treatments. 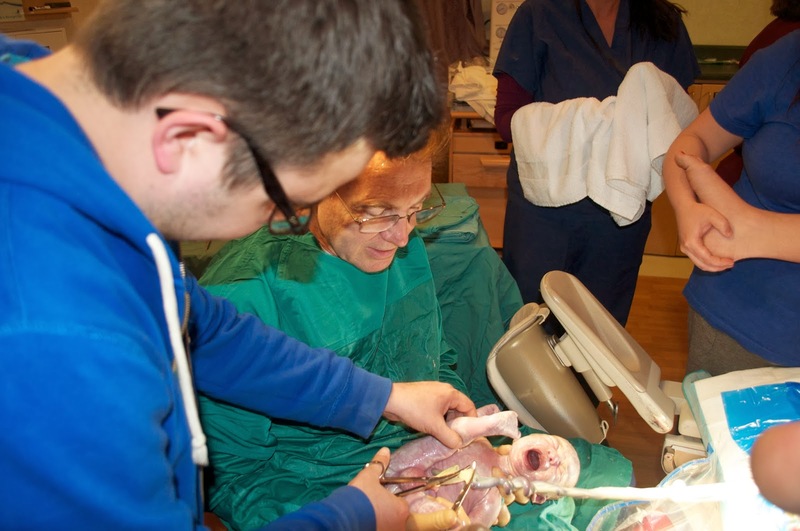 I had several friends offer to be a surrogate for me (they were so sweet!). Everything seemed so expensive. I didn't have health insurance anymore because of my infertility and all of the treatments we talked about didn't sound like the right thing. I started becoming really angry with life, with God, with everything. It was a pretty rough time for Chris and I.